This entry was posted in Basketball and tagged Steve Alford, UCLA men's basketball by Jack Wang. Bookmark the permalink. Nice gesture. He should never have gotten it in the first place, but this is a good thing to do. queue the “BS” calls from the goons at Bruins Nation. Regardless of intentions, this is unprecedented, it’s a class move, and he cannot be criticized for it without the criticizer looking like a huge fool. One has to wonder if it was part of some other negotiation regarding his assistant coaches or something else within the Athletic Department. Perhaps not, but I simply have very little faith in this guy. Let’s see how many players stay with the program and if Coach Alford scales back his son’s minutes next year with the amount of talent coming in. i initially thought it was part of a negotiation, but when you think about it, why would it be? He had absolutely no incentive to do this. If the school wanted to fire him with a smaller buyout, they could have negotiated that just as easily. This was all Coach, but his reasons are what is unclear. There were rumblings that he was being forced to make changes to his staff or lower his buyout. That may be a reason. The way the Athletic Department is run, if he gets a Sweet 16 this year they will probably give him another extension. If he actually improves the defense, it will be a surprise. He either needs to get his own kid to play defense or sit him on the bench. Do you see either one of those things happening at this point? Coach Alford still needs to produce results, but this class move indicates to me that his heart is in the right place. It appears he is suffering more than anyone over what happened this season, so I am happy for him that he has a chance to redeem himself. Surely he will leave no stone unturned in his efforts to restore the program back to where it belongs. Looking forward to hungry teams next year and beyond. This is exactly what UCLA’s AD wants you to believe. The truth is that after getting pressure from donors to fire Alford, Guerrero came up with the genius plan to demand that Alford fire his assistants or agree to a reduced buy-out. Guess what, Alford agreed to the only feasible option, reduce his buy-out, because he can’t hire a new staff that might actually disagree with his plan to feature Bryce on the team. Alford did not come up with this on his own or agree to it out of the goodness of his heart. This letter is a pure PR stunt. David Woods wrote a perfect compilation of all that wrong with the program right now. Alford would be better served not only giving back his extension but altogether canceling his contract. Why would anyone, much less Alford, give away $8 million by quitting? Alford certainly shows class by his move. But he also shows smarts by not quitting. the $8 million is not upfront. It’s amortized over the remainder of the contract. And if he gets another job, that further removes the $8 million. 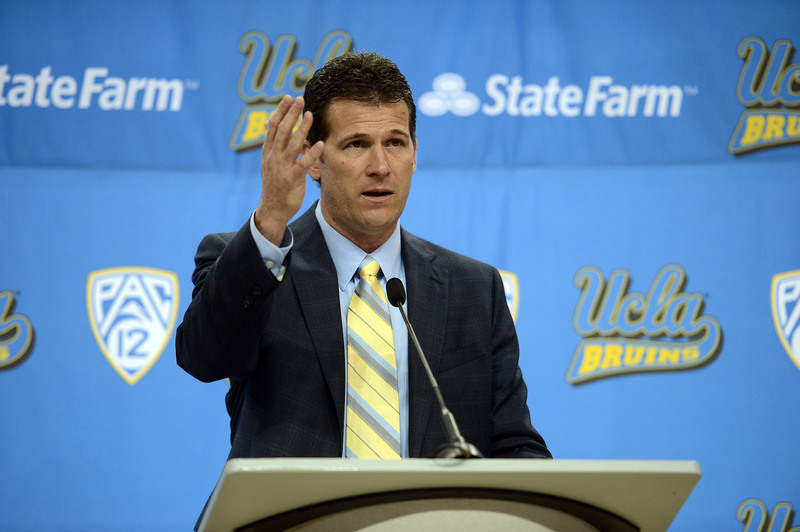 Any calls to fire Steve Alford are thoughtless. They don’t realize that it costs $8 million to fire him. First, the buyout was a huge mistake by the AD. Second, how much does it cost in lost revenue to keep him? The only consequence I see with this is Alford forfeit’s about $3M if Ucla fires him after next season. He’s still the coach for several more seasons. After next year, Ucla basically needs to sack him or give him another extension. College coaching contracts rarely simply expire. The coach needs to be under contract 4+ years otherwise recruiting suffers with no certainty of the coach being around. I can’t help but be skeptical of the motivation here. There probably is something bigger at work here, such as Alford doing this in exchange for something else. Regaining stature in the Pac 10 is a difficult enough challenge, but becoming a national presence feels light years away. Even many of the teams that lost in the round of 32 this weekend played with much more determination and poise than I’ve seen from Ucla in a long time. unusual to see a coach owning up to this degree. but the rubber meets the road next year…Lorenzo should have the ball a LOT next year. Bryce is gonna have to play behind him or as back up off guard. TJ starts. let the 5 stars play, this ain’t Indiana in the 70’s. on a side note, my graphological analysis of Alford’s signature indicates an analytical mind with attention to detail, but very cautious and reserved personality. this is not a great trait insofar as it results in a coach slow to evolve or change what is not working (as we saw last season). OK, that’s a wrap, let’s just move on to Football, shall we? I commend Coach Alford’s integrity. Coach Wooden would be proud. Class act, taking full responsibility for his lack of performance on the court. Alford–whether he’s fired or kept on, whether he gets the program back on track or not–showed character in this move. I’m a bit more cynical than you on this, EB. I think it was orchestrated as a PR move by the athletic department in the wake of protests to fire Alford. With a strong class coming in, it’s likely to be a decent year coming up and the extension will be reinstated and we are back to the original buyout with a less than mediocre coach. That is my take on things. I hope you are wrong but suspect you are right. I hope I am wrong too. Maybe he will get struck by lightning and bench his own kid for not defending! Strange that none of the comments here mention the person who gave him this ridiculous buyout. Either Alford has a great agent, or Guerrero was foolish to guarantee that much money. He has overseen 2 poor football coach hirings (although the current one has been much better than many of the previous coaches), and clearly a bad basketball coach hiring with terrible terms. Guerrero needs to go.